We’ve been to Crumble & Flake four times, but only managed to eat anything once. OK, twice. It’s a common story; chef and owner Neil Robertson’s bakery has been besieged by pastry fiends since it opened its doors in early summer. 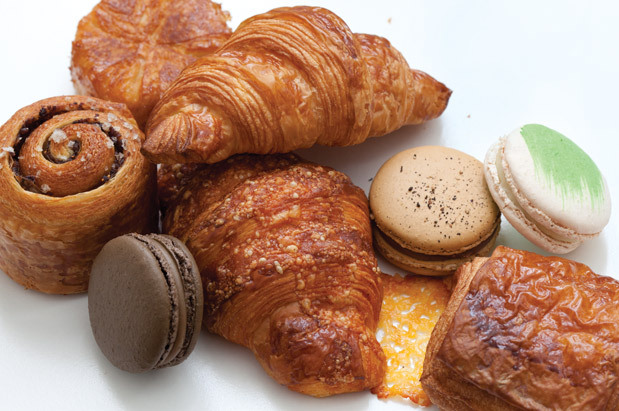 These fanatics are willing to wait a half hour in lines that can stretch up the block beginning at dawn for whatever might be left in the case, because Robertson makes a limited number of croissants, scones, kouign amann, cookies and cream puffs, and when those are gone, that’s it for the day. And while the hours on the website claim the place stays open until 3 p.m., it rarely does, and you should shave, oh, about five hours off that estimate if you want to taste anything (yes, really). So the real question is: Are these painstakingly crafted pastries worth jumping through hoops to taste them? In some cases, yes, most definitely. The tender croissants are quite good ($2.50)—the chocolate version is particularly so ($3), with a rich, slightly sweet chocolate bringing a nice balance to the buttery flake of the pastry. The cinnamon rolls ($3.50) are truly divine, and the “cheweos” ($2.50) are a fun play on Oreo cookies—tenderer and softer, with real butter in the filling. And oh, those cream puffs ($3.50)! We’ve heard rhapsodic things about the kouign amann ($2.75), but sadly, we’ve never gotten there early enough to get our hands on one. Someone, be a dear and remind me to set my alarm. You should know: Sells out very early (often by 9 a.m.! ); takeout only, no seating; closed Monday and Tuesday. Get directions.